When I first started blogging I remember how overwhelmed I was with the thought of setting up an email list, let alone maintaining it. I got one going from the very beginning but it wasn’t until about a year in that I actually set it up properly and now I really wish I would have put some effort into it way sooner. It was one of those things that I just didn’t think I could figure out. I’ll admit that I did about 10 things wrong before I got it right. But now it is working for me in so many amazing ways. If you have been putting off getting your email list set up listen up! 1 || My email list allows me to truly connect with my readers. I must have read “you need to write about what your readers want to know” a zillion times when it dawned on me, if I want to know what my readers need, I probably should ask them. So I did! I started with my email list and the response was fantastic! I was able to hear about their struggles in a way that felt like I was talking to a friend and that connection was what my blog was missing for so long. Them telling me what they struggle with helps me so much when I’m planning content and when I write a post about something that many of my readers struggle with, they feel valued and will come back for more! A win-win! 2 || I can automatically point my readers to awesome content that they haven’t seen. As my archives grew, I realized that a lot of really helpful posts were getting buried. I had an opt in offer at the time, but the reality was that the printable I was offering was not a good reflection of what my blog was about. I was having people sign up to get the free printable, but then they wouldn’t open the emails I was sending. That gets really frustrating, especially when you are spending 50+ bucks a month to have them on your list! What I wanted was an opt in offer that was a direct reflection of what readers would find on my blog and get them aquainted with my content. If they like what they see, they stay, if they don’t they opt out and I’m left with a healthy list that opens my emails and is part of the community here. So I set up an auto responder that highlights my best content and helps my readers make home their favorite place to be. Upon opting in, they receive one email per week pointing them to various themed content. Now they have (hopefully) learned something, been inspired, and are well aquainted with content that I worked hard to create for them. 3 || I ask my readers to join the conversation on social media. So what I’ve done on occasion when sending out a new post to my readers is to invite them to join the conversation on FB and link directly to my FB post on the subject. Your readers are your people and since you already have a relationship with them, they are more likely to chime in, especially if you ask them to. This does take a bit of time, and it means that you have to have your FB post go up before you can send out the email, but it can be really worth the little bit of time and effort. You can do the same with Pinterest and Twitter. Just have a link directly to the post you want them to retweet or the pin you want them to repin. Remember, your readers are already your fans and they are the best way to help you spread the word about your awesomeness! These 3 things have helped me grow my blog in ways I hadn’t even thought about. Of course I had to figure out how to do all of these these technical things the hard way (a ton of trial and error and google searching) but you don’t have to! 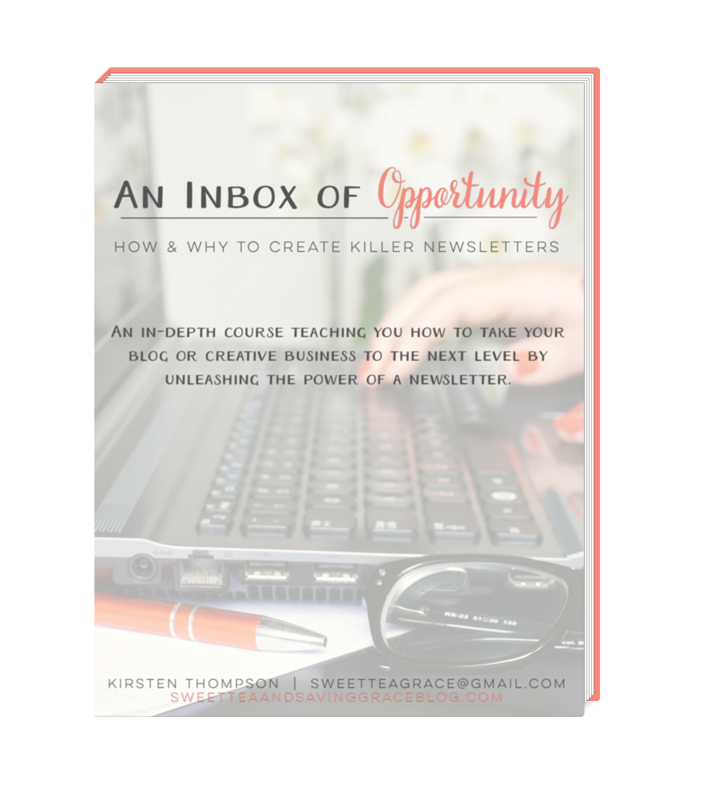 My friend Kirsten at Sweet Tea and Saving Grace recently launched An Inbox of Opportunity, an amazing e-book and course that will pretty much hold your hand and tell you exactly where to click to get you going or significantly improve what you already have going. She covers everything from setting up your list to improving how you use it like making it super personal, branded, and setting up your own auto responder. I consider myself pretty well versed when it comes to Mailchimp, but after reading through An Inbox of Opportunity I learned even more ways to improve the emails I send out to my readers and engage with them even more! Where were all of these easy to follow steps complete with screen shots when I was getting started? Kirsten literally walks you through every single step from where you are currently to where you need to be with managing your email list and gives some great tips and tricks that I hadn’t even thought of to make my email stand out as my own. This course is so packed full of information and each section has assignments to keep you on track and take one thing at a time so you don’t get overwhelmed. So if you are just getting started with an email list or you have one, but know it could use some love, head on over and check out An Inbox of Opportunity. It will save you so much time and you will be connecting with your readers in ways that make blogging so much more fun! A big THANK YOU to Kirsten for creating this amazing course and sharing it with me to share with you! This post contains affiliate links. 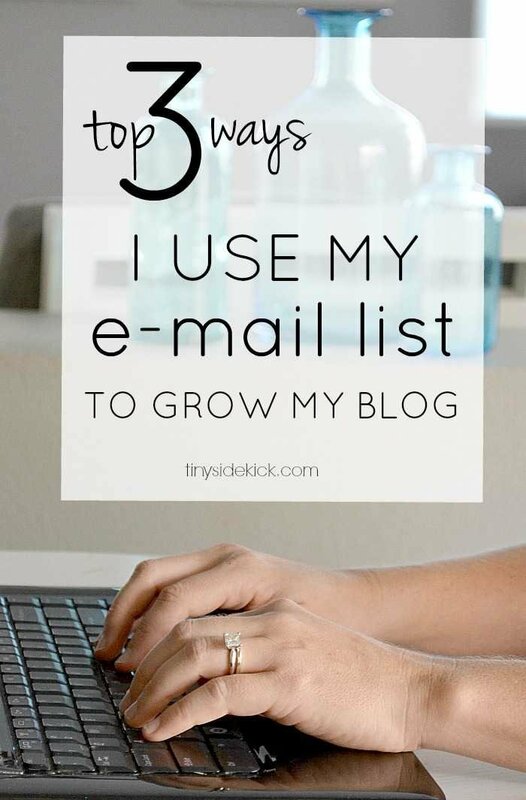 My positive recommendation that An Inbox of Opportunity will help you grow your blog and connect with your readers is 100% my own. You can read my full disclosure here. So you want to try a gallery wall? Making good use of my email list has been a mystery to me. After 5 years of blogging, I am no closer to conquering it than I was at the start. I guess I should be proud of myself that I even started one but that’s about as far as it goes. Thanks so much for sharing these tips and I do intend to get Kirsten’s ebook. I need it! Thanks Corey. Hey, if you are a blog hopper, come over tomorrow night (7pm ET Tues) to Wonderful Wednesday Blog Hop on Ducks ‘n a Row and party with us! Such great tips! I never thought about using my email to send out old posts but that is totally a great way to revive them and get them seen again! Thanks – pinned for when I have one spare moment!! When will that happen? Corey … these are great tips!! I never would have thought of asking people to ‘join in the conversation over on FB …”!! My email list has not been a priority, but I think I’ll try to amp it up now!! Thanks for the post … comes at a great time for me! You’re such a smartie blogger. Thank you, thank you, thank you Corey for such a hugely positive review! I’m so glad even someone as seasoned and well-established as you found it so helpful! I love that you utilize your archived posts to introduce new readers with your content, and further engage existing readers with what they already love. Thanks again friend! I appreciate your support so much!